D.C.’s Deanwood neighborhood can now lay claim to the city’s first two homes designed and built with the cutting-edge features of a “passive house” that’s so energy efficient it approaches “net zero” – producing all of the energy it needs. A Dec. 4 ribbon-cutting ceremony at the Empowerhouse on Gault Place N.E. 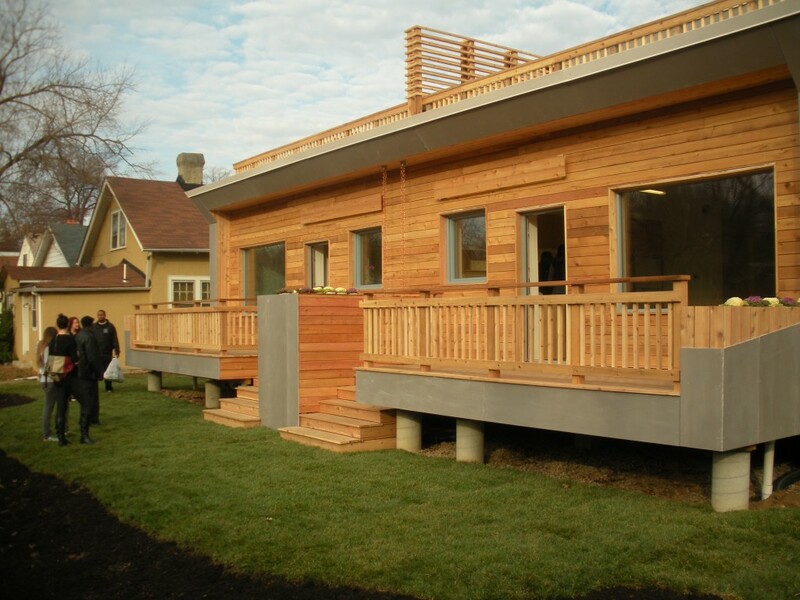 gave the public a chance to tour the innovative duplex, which emerged from last year’s Solar Decathlon competition. The biennial decathlon, sponsored by the U.S. Department of Energy, challenges collegiate teams to design, build, and operate solar-powered houses that are cost-effective, energy-efficient, and appealing to homebuyers. In its first incarnation at last year’s decathlon in West Potomac Park, Empowerhouse was built as a single-family home by a team of students from two schools — Stevens Institute of Technology in Hoboken, N.J., and The New School in New York City. Empowerhouse tied for first place in the decathlon’s affordability category, with an estimated construction cost of $229,890. That was nearly $20,000 less than the estimated cost of the other first-place honoree, a house designed by students from Ghent University in Belgium. Empowerhouse placed 13th overall out of 19 teams that competed. “Having come to the [Solar Decathlon] competition several times over the years, it always seemed to me that it was a shame that the houses packed up and left, and so we decided they should stay, and that’s what we did,” said Joel Towers, executive dean of Parsons the New School for Design, one of The New School’s seven divisions. The Empowerhouse has been reborn in the 4600 block of Gault Place N.E. on three vacant lots donated by the D.C. Department of Housing and Community Development. A second story was added, along with an adjoining unit that makes the Empowerhouse a duplex. Each 1,300-square-foot unit has three bedrooms and two baths, plus a 300-square-foot upper deck. The estimated cost of each unit is now $230,000 to 250,000, not including land, said Susanne Slater, president and CEO of Habitat for Humanity of Washington, D.C., which built the Gault Place duplex in collaboration with the Empowerhouse team from Stevens and The New School. The cost of a passive house depends on how it is sited, taking into account both topography and its position relative to the sun. D.C.’s Empowerhouse enjoys an awesome site overlooking the Watts Branch stream valley, with large windows at the rear of the house to capture winter sunlight from the south. Passive house design, more commonly found in Germany, combines virtually airtight construction, super insulation, and a high-tech energy-recovery ventilation system that provides a constant supply of fresh air. The design also eliminates so-called “thermal bridges” that leak heat, such as steel studs in an otherwise well-insulated wall. 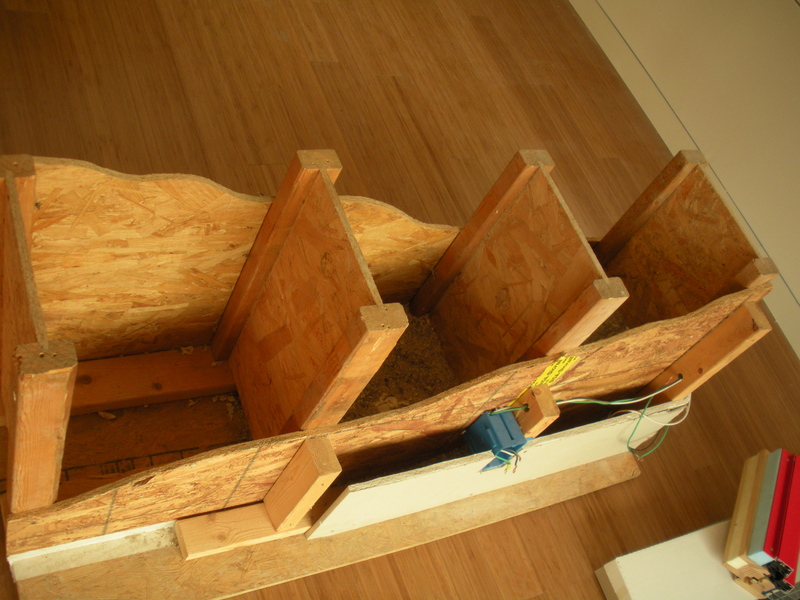 A cutaway mockup of an exterior wall at the Empowerhouse shows the 12-inch space filled with shredded newspaper for insulation. Visible on the near side of mockup is a blue electrical outlet box. A tour of the Gault Place house revealed 12-inch-thick exterior walls filled with shredded newspaper and triple-pane doors and windows that look like transparent bank-vault doors. Although it features path-breaking design, the Empowerhouse was built “by students and unskilled volunteers using standard building practices and off-the-shelf materials,” said Steve Scribner, the project’s student manager and a recent architecture graduate of Parsons. Most of the heat in a passive house comes from sunlight, electrical appliances, and the occupants’ own body heat. Shading protects windows from the summer sun. Proponents of passive-house design say it uses up to 90 percent less energy than traditional homes, with only a small supplemental energy source required. Each unit of the Empowerhouse duplex has a rooftop array of 20 solar panels that produces 5.2-kilowatts of electricity. Slater said the Empowerhouse is expected to occasionally pull electricity from the grid, “but we have no idea how much,” so Habitat will conduct a two-year study of the residents’ electricity usage. Dorothy Jackson, a public-housing resident who also works for the D.C. Housing Authority, will move into one of the Empowerhouse units; the other will be occupied by Lakiya Culley, an administrative assistant at the U.S. State Department and the mother of three young boys. By saving each homeowner at least $2,000 a year in energy costs – a conservative estimate for a net-zero structure – the Empowerhouse will pay back its entire front-end cost over its expected lifetime, said Richard King, the director of the Solar Decathlon. Towers, the Parsons dean, said D.C. city agencies were “super helpful” as the Empowerhouse team negotiated the building-permit process. Of particular note, according to Briggs, is the unusually small heating system in Empowerhouse, a reflection of its drastically reduced heating and cooling load. Technical expertise for the Empowerhouse project, including training in specialized construction techniques, was provided by Passive House Institute US of Urbana, Ill., a nonprofit organization that promotes passive-house design and certifies passive-house consultants. Katrin Klingenberg, the institute’s executive director, agreed that D.C. officials “had no problem whatsoever” with the materials and building techniques of the Empowerhouse. But in some locales, she said, building codes take a prescriptive approach by requiring, for example, certain heating and cooling capacities. The Empowerhouse site on Gault Place features innovative rainwater management practices, including porous-pavement driveways. Each unit of the duplex has a 30-gallon rain barrel on its rear deck with overflow to a 1,000-gallon cistern buried in the side yard. Overflow from the cistern is routed to a rain garden at the rear of the house, where a depressed bed of gravel topped by a layer of nutrient-rich soil disperses the water and supports plants that thrive in a wet environment. A similar arrangement of gravel and topsoil along the front sidewalk collects storm water from the street, with overflow to the rain garden. “The water-management system here is definitely a very extreme eco-friendly and kind of cutting-edge technology to try and accept the water that’s coming [from rain] and use, rather than just dumping it into the sewers,” said Dan Hines, a Habitat construction supervisor. Habitat plans to build six additional passive houses on Central Place N.E. in the Ivy City neighborhood. They were designed by Zavos Architecture + Design of Frederick, Md. Litterblog notes with regret that, for the first time since the Solar Decathlon’s inception in 2002, it will move next year from Washington, D.C., to Irvine, Calif. The 20 competitors at the 2013 Solar Decathlon will include a team of collaborating students from American University, the Catholic University of America, and George Washington University. Wayne Savage is the owner of Mid-Atlantic Litter Cleanup Service, a Washington, D.C.-based public space litter-removal company. He was a volunteer with the bicycle valet service at the 2011 Solar Decathlon. This entry was posted in D.C. Department of Housing and Community Development, Empowerhouse, Habitat for Humanity, Parsons The New School for Design, Passive House Institute US, Solar Decathlon, Stevens Institute of Technology, The New School, U.S. Department of Energy, Zavos Architecture + Design by Wayne Savage. Bookmark the permalink.